"Heave ho, mateys! It’s time to hit the waves with the most adorable captain on the high seas. The only problem? “Captain Pug” is terrified of water and would rather sit around and eat jam tarts. What’s a pug to do?" On one very ordinary day Pug's nose knows that breakfast is on its way. And with breakfast, come crumbs – but not just any old crumbs, jam tart crumbs. Jam tarts are Pug's favorite food, and he loves nothing more than to share them with his best friend, Lady Miranda. But just before Pug can finish the last jam tart, Lady Miranda picks him up and whisks him away for a sea-faring adventure. Unfortunately for Pug, it turns out that water may be his biggest fear! This delightful story of friendship is perfect for fans of Diva and Flea. Laura James worked on projects including Veronica Guerin and Slumdog Millionaire before signing herself up for a MA in Writing for Young People at Bath Spa University, England. 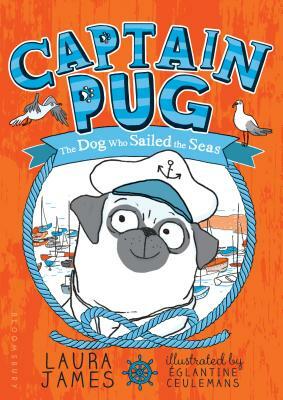 Her love of all things nautical comes from her dad, a retired naval officer, and the adventures of Pug are based on the antics of her own very silly dog, Brian. Laura lives in Bath, England. Églantine Ceulemans works in an intuitive way combining humor and sensitivity. She has been published in France but this is Eg's first book with Bloomsbury. Eg lives in Lyon, France.